The second Westside-ish bakery to open in less than a week (along with simplethings), Sweet E's Bakeshop opened last Wednesday near the corner of Pico and Robertson. It's a nice addition to a neighborhood better known for kosher markets than high-end cupcakeries, but there's not much to be excited about here. The shop has a limited and unimpressive cupcake selection. Except for the vegan chocolate cupcake, which was strong and not overly sweet, the flavors were generally bland. Their cupcakes are only slightly bigger than most mini-cupcakes, but Sweet E's sells for $2 each, which seems like an awful lot for such a small treat. Sweet E's also sells cake lollipops and, for a direct sugar hit minus the pretense of cake, mini-frosting-filled ice cream cones. Both were, again, decent but forgettable. 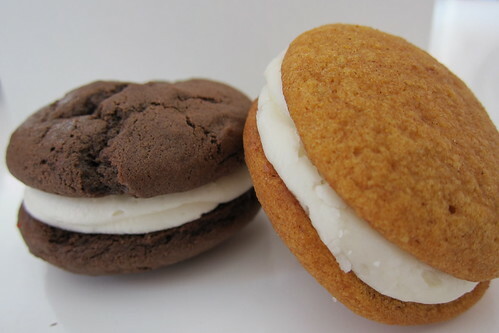 The one item Sweet E's does exceptionally well: their pumpkin spice whoopie pie. So many whoopie pies are dense, hardened discs packed with dry frosting, but the whoopie pies here are soft and full of flavor. The cake was perfectly balanced, not overpowering or underspiced, and the frosting had a hint of tang.